The United States National Guard, also commonly referred to as the National Guard, is part of the reserve components of the United States Armed Forces. It is a reserve military force composed of National Guard military members or units of each state and the territories of Guam, the Virgin Islands, Puerto Rico, and the District of Columbia, for a total of 54 separate organizations. 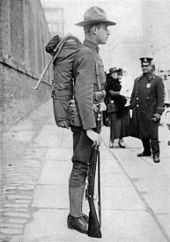 All members of the National Guard of the United States are also members of the militia of the United States as defined by 10 U.S.C. § 246. 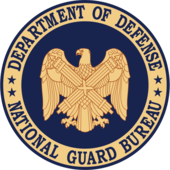 National Guard units are under the dual control of the state and the federal government. The National Guard is a joint activity of the United States Department of Defense (DoD) composed of reserve components of the United States Army and the United States Air Force: the Army National Guard and the Air National Guard, respectively. 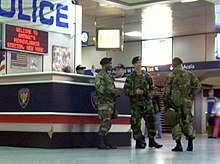 The National Guard of the several states, territories, and the District of Columbia serves as part of the first line of defense for the United States. 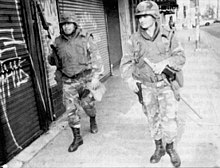 The state National Guard is organized into units stationed in each of the 50 states, three territories, and the District of Columbia, and operates under their respective state or territorial governor, except in the instance of Washington, D.C., where the National Guard operates under the President of the United States or his designee. The governors exercise control through the state adjutants general. The National Guard may be called up for active duty by the governors to help respond to domestic emergencies and disasters, such as hurricanes, floods, and earthquakes. Prior to 2008, the functions of Agricultural Development Teams were within Provincial Reconstruction Teams of the US Government. Today, ADTs consist of soldiers and airmen from the Army National Guard and the Air National Guard. Today, ADTs bring "an effective platform for enhanced dialogue, building confidence, sharing interests, and increasing cooperation amongst the disparate peoples and tribes of Afghanistan. "These teams are not only affiliated with the military, they frequently work across agencies, for example with USAID and the Department of State. ADTs provide education and expertise on the ground, while also providing security and order that is traditionally affiliated with the military. These teams have been essential to the counterinsurgency efforts in Afghanistan as a public diplomacy tool to build relations with the local people in the tribes and provinces of the country. ADTs also enhance public diplomacy in Afghanistan by providing security to the local provinces they are working within. This tool has provided the teams with the civilian-military partnership that is needed to conduct public diplomacy and defeat the insurgents in Afghanistan. President Barack Obama said that the US will enhance agricultural development instead of big reconstruction projects to build Afghanistan's economy, to have an immediate impact on the Afghan people. Today, these projects include "...basic gardening practices, to large watershed and irrigation projects. There are also projects that teach bee keeping and livestock production: all of which will have a positive impact on unemployment, hunger, and the ability to sustain future generations. More and more Afghan tribal leaders have been requesting additional ADTs, which illustrates how important the use of public diplomacy has been in the efforts to win the trust of the Afghan people. The case study from Nangarhar Province in Afghanistan serves as an excellent example. This province is one of the most stable and secure provinces in Afghanistan. For example, over 100,000 Afghans have returned to province; the province has also been declared poppy-free in 2007 by the UN. Additionally, most districts within the province have all-weather paved roads and it is also one of the most productive agricultural regions in Afghanistan.ADT should further its progress within the provinces of Afghanistan in agricultural education, technical support, and logistics. To defeat the insurgency in Afghanistan public diplomacy is an essential force, ADTs help the US educate the population of Afghanistan with the hope of strengthening Afghan trust in the American mission in Afghanistan. 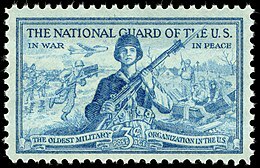 ^ "Army National Guard — Today's Military". www.todaysmilitary.com. Retrieved April 25, 2019. ^ "FAQ Page". Air National Guard. Retrieved April 25, 2019. ^ "U.S. Army Ranks". www.army.mil. Retrieved April 25, 2019. ^ "Guard Pay". Recruiting. Retrieved April 25, 2019. ^ "GRICULTURAL DEVELOPMENT TEAMS AND THE COUNTERINSURGENCY EFFORT IN AFGHANISTAN" (PDF). ^ "U.S. Army Agriculture Development Teams". Science & Diplomacy. Retrieved April 25, 2019. ^ a b "AGRICULTURAL DEVELOPMENT TEAMS AND THE COUNTERINSURGENCY EFFORT IN AFGHANISTAN" (PDF).